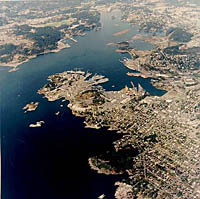 Located in the Esquimalt area of Victoria BC. This 1940's house has proven its quality with the test of time and along with additions over the years has become a very nice private home. A three bedroom home, updated bathroom with a soaker tub, a large bright kitchen with an eating area, vinyl thermal windows, wood burning fireplace (chimney has been cleaned), spacious laundry/mud room, large SUNDECK, eleven year old roof. A place of piece and comfort with the bonus of a fenced in yard (pet friendly). Add to that the advantage of being very convenient to everything from seven minutes to Downtown to golf to the Military Base with parks and schools being a five minute walk and you have yourself a gem of urban housing in the unexpected metro Victoria area. Nicely priced and well situated. Offered at $405,000. Immediate possession is available.